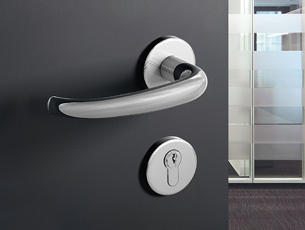 The Range 170 door lever handles are characterised by their simple, reduced shape and harmonious lines. The organic style of Range 170 is optimally matched to the movement of the hand on opening and closing the door. The curve ends pointed towards the door leaf and enables a good hold and prevents the hand from slipping off. Range 170 includes door lever handles and window handles. The hardware can be combined with a round rose and knobs and backplates. Range 170 fulfils the Grade 3 and 4 requirements to EN 1906 and is therefore suitable for use in projects. In addition, the hardware conforms to the criteria of DIN 18273 and ÖNORM B 3859. Range 170 is made of high-quality stainless steel with satin polished finish.